The Anniversary Map Pack was the third DLC map pack released for Halo: Reach. The map pack was released on November 15, 2011 on Xbox LIVE for 1200 Microsoft Points, as well as being bundled with Halo: Combat Evolved Anniversary as a download code. 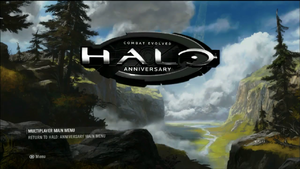 The maps are also available on the disc of Halo: Anniversary itself, serving as its multiplayer component. The Anniversary Map Pack includes seven new Achievements, with a total of 250 Gamerscore. Unlike the achievements released with the Noble and Defiant map packs, these achievements can only be unlocked while playing on Anniversary maps. A collaborative effort between 343 Industries and Certain Affinity, the map pack includes six remastered multiplayer maps from Halo: Combat Evolved and Halo 2. The maps have been optimized for Halo: Reach multiplayer, with changes in layout, weapon availability, and vehicle selection. A Forge variant completely identical to the original iteration is also available for each map. Installation 04, the first Firefight map with friendly AI assistance, is also included. It should be noted that if one downloads the map pack to Halo: Reach, the exact remake of each map will be absent; only the "remastered" versions will be present. The missing maps can be downloaded normally from the player's temporary history. Battle Canyon is a remake of the Halo 2 map Beaver Creek. Penance is a remake of the original Halo map Damnation. Like Damnation, it is set within a Covenant hydro-processing center. Instead of being located on Installation 04, however, Penance is set on Buwan, one of the natural satellites of the Unggoy homeworld Balaho. High Noon is a remake of the original Halo map Hang 'Em High. It is set within a Forerunner slipspace portal generator facility. Ridgeline is a remake of the Halo PC map Timberland. It is set on Installation 04 and is the first map within the Halo series to use trees as Forge items. Solitary is a remake of the original Halo map Prisoner. Breakneck is a remake of the Halo 2 map Headlong. As opposed to Headlong, it is set within New Mombasa's Section 21 instead of Section 14. Installation 04 is a Firefight map based on the final engagement of the campaign level Halo. Orbital Drop Shock Troopers will assist the player in eliminating the Covenant hordes, a first in Firefight history. Top Shot - 50G - Get 3 headshot kills in a row in a matchmade game. Emergency Room - 15G - Infect 3 players in a single round in a matchmade Infection game. Stick it to the Man! - 20G - Stick and kill a flag carrier with a plasma grenade in a matchmade game. Dive Bomber - 50G - Melee an enemy from behind while using the jetpack during matchmaking. License to Kill - 15G - Run over 5 people with a vehicle in a matchmade game. Bounty Hunter - 75G - Capture 10 skulls at once in a matchmade Headhunter game. From Hell's Heart - 25G - Kill an enemy player that sticks you with a plasma grenade with their own grenade in a matchmade game. The Behind the Scenes: Anniversary Multiplayer trailer was released on August 27, 2011. Featuring exclusive interviews with 343 Industries employees, the video traces how the developers have chosen which maps should be remake for Halo: Anniversary, as well as the development process for the maps themselves. Integration with Halo: Reach's multiplayer component is also discussed. According to David Ellis, the unreleased "GRD" armor was supposed to have been included as part of the Anniversary Map Pack. However, it was cut before release due to time and resource constraints, and was instead featured via the doll Easter egg.